From the outset Mortem has a strong presence. It shoves its way onto the screen and forces you to pay attention with its striking visual and base filled soundtrack. You can’t ignore it. 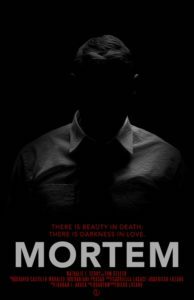 Mortem focuses on death but looks at it in a unique and individual way. It almost mocks the living, and the living is excited by it. Death evokes an intense response and here we see it manifested and visualised in a way that is beautiful. Mortem is short at under five minutes long yet it feels much longer. Made up of one scene that focuses on two characters in one location it should drag, especially as there is no dialogue and very little interaction between characters. Yet it is hard to take your eyes of this captivating piece of film. The make-up is exceptional as is the set design which provide striking and provocative visual imagery. From the glitter used for blood to the black cigarette there is an attention to detail that is exceptional in a film that is so simplistic in terms of narrative. Despite this simplicity the characters still portray a depth that makes them interesting and well developed. There is no dialogue and yet these characters have a history. They have emotions and motivations that are pushing them forwards. The lack of dialogue is barely noticeable. The actors do a tremendous job of eliciting excitement, tension and drama without having to speak or even move for the most part. Their individual actions and reactions speak volumes and provide the audience with all they need. There is a tension between the characters that is tangible. There is fear, there is thrill and there is desire all wrapped up in a single glance or an instance of eye contact. For a film of this length, Mortem is utterly astounding in its delivery.